"In anticipation of the upcoming release of the “Heroes” soundtrack album from NBC Universal, "Heroes" executive producer and director Allan Arkush has crafted five unique music video podcasts that will be exclusively available for free download on Zune Marketplace. Each video short features exclusive edits of "Heroes" footage set to select tracks from the album. Nada Surf's "Weightless" provides the soundtrack to the first video, which debuts February 29 on Zune Marketplace and MSN (http://tv.msn.com). Four additional music video podcasts will roll out on Zune Marketplace leading up to the album's release on March 18. The podcasts will feature the exclusive new releases “He's Frank” by Brighton Port Authority featuring Iggy Pop, “Not Now But Soon” by Imogen Heap and “Keeping My Composure” by The Chemical Brothers featuring Spank Rock, as well as “Man In The Long Black Coat” by Bob Dylan. "Heroes" fans can collect all five and easily sync them to their Zune portable media player to watch on the go." If you're a Heroes fan (and I count myself among that group), this will definitely interest you - the music on Heroes has always been quite unique and compelling. Want to subscribe with your Zune software? Hit this link. Full press release after the break. UNIVERSAL CITY, CA-February 28, 2008-NBC Universal Television, DVD, Music & Consumer Products Group is set to release the original television soundtrack album to NBC's Emmy and Golden Globe nominated drama "Heroes" on March 18. Featuring several exclusive new singles, the album is executive produced by independent music veteran Errol Kolosine ("Six Feet Under" in collaboration with "Heroes" creator & executive producer Tim Kring and "Heroes" executive producer & director Allan Arkush ("Crossing Jordan," "The Temptations" and classic cult film "Rock 'n Roll High School!" . It offers an eclectic mix of cutting-edge and classic musical artists including Bob Dylan, Panic! At The Disco, Wilco, Imogen Heap, as well as a number of collaborations from top acts including a duo with Brighton Port Authority and Iggy Pop. The album also offers The Jesus & Mary Chain's first new studio recording in more than a decade, "All Things Must Pass." The 18-track compilation opens with the show's composers, Wendy & Lisa's "Heroes" theme song and also includes Wilco's "Glad It's Over" and the soon-to-be-released track by Panic! At The Disco, "Nine in the Afternoon." Other performers on the album include Nada Surf ("Weightless" , Death Cab For Cutie ("Jealousy Rides With Me" , Cucu Diamantes & Yerba Buena ("Maya's Theme" , Sheila Chandra ("ABoneConeDrone 3" and My Morning Jacket ("Chills" . Rounding out the soundtrack are classic cuts from Bob Dylan ("Man in the Long Black Coat" and Davie Bowie ("Heroes" . In addition, "Heroes" executive producer and director Allan Arkush has crafted five unique music video podcasts that will be exclusively available for free download on Zune Marketplace. 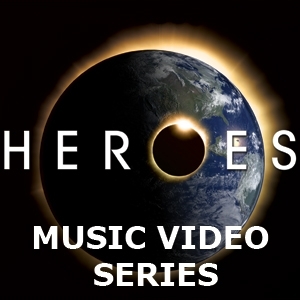 Each video short features exclusive edits of "Heroes" footage set to select tracks from the album. Nada Surf's "Weightless" provides the soundtrack to the first video, which debuts February 29 on Zune Marketplace and MSN (http://tv.msn.com). Four additional music video podcasts will roll out on Zune Marketplace in the coming weeks, leading up to the album's release. "Heroes" fans can collect all five and easily sync them to their Zune portable media player to watch on the go. The "Heroes" soundtrack will be available March 18 only at Best Buy stores and is available for pre-order now at www.bestbuy.com. CD tracks will also be available digitally on Zune Marketplace and other digital service providers at that time. The album is being released through the NBC Records label. "'Heroes' is such a unique series, with a very loyal fan base," said Shelli Hill, Vice President, NBC Universal Television DVD, Music & Consumer Products. "We are thrilled to be able to offer a tremendous selection of artists and music and give the audience another way to connect with the show they love." "For a long time music and comic dork like myself, this project has been a dream come true," said Errol Kolosine. "Allan and the team behind "Heroes" had a commitment to making this soundtrack as unique and inspiring as the show itself, which is how we managed this stellar selection of musical heroes. It was also exciting to make the album direct with NBC, without the intrusion of any label or other entity that might have challenged the integrity of the project." "Music is an integral part of "Heroes," both in the creation and inspiration for the series, and also in the finished product," said Allan Arkush. "Errol Kolosine helped us focus our grand and truly bizarre ideas into a cohesive vision and helped us assemble a powerful collection of songs that really reflect the drama and feel of our show." "We are excited to partner with a great talent like Allan Arkush to bring the music of the soundtrack to life through creative edits of "Heroes" footage," said Richard Winn, Director of Entertainment Development, Zune. This podcast series is part of our plan to make more original content available via Zune Marketplace. "We are delighted to give our customers and the show's fans the very first opportunity to own this amazing compilation of great music," noted Gary Arnold, senior entertainment officer for Best Buy. NBC's Emmy and Golden Globe-nominated drama series "Heroes" chronicles the lives of ordinary people who discover they possess extraordinary abilities. Joining creator/writer Tim Kring as executive producers are Dennis Hammer (NBC's "Crossing Jordan" , Allan Arkush ("Crossing Jordan" and Greg Beeman ("Smallville" . The show has been honored with a People's Choice Award, an AFI Award, a Multicultural Prism Award and the TV Land Future Classic Award, as well as the TV Critics Association Awards' Outstanding Program of the Year and nominations at the NAACP Image Awards, WGA Awards and Satellite Awards. Produced by Universal Media Studios in association with Tailwind Productions, "Heroes" returns for a third season on NBC in Fall 2008. NBC Universal is a leader in providing entertainment programming to the domestic and international marketplaces. NBC Universal Television DVD, Music and Consumer Product Group manages all global ancillary television business endeavors for The NBC Universal Television Group, including third-party home entertainment distribution, consumer products, musical soundtracks, special market projects and the NBC Universal Online Store. Zune is Microsoft's music and entertainment brand that provides an integrated digital entertainment experience. The Zune platform includes a line of portable wireless media players, the Zune Marketplace online store, and Zune Social, created to help people discover music. Zune is part of Microsoft's Entertainment and Devices Division and supports the company's software-based services vision to help drive innovation in the digital entertainment space. More information can be found online at http://www.zune.net/en-us/press."